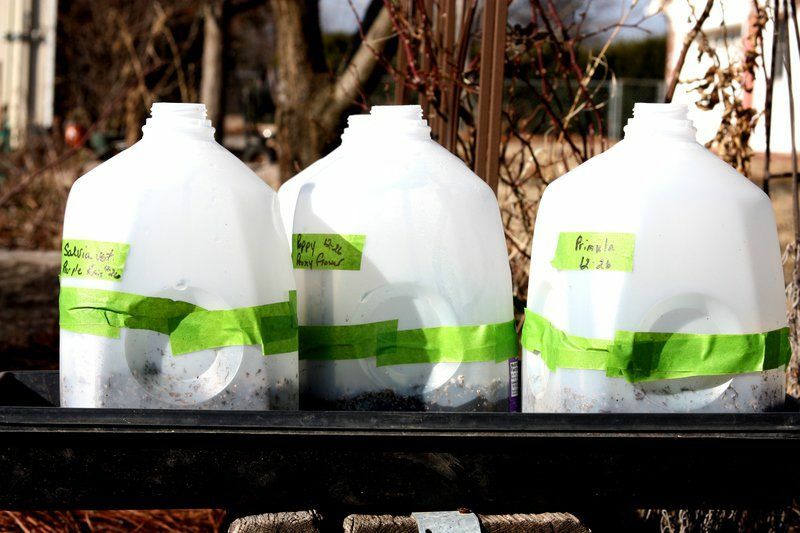 If you want to get a jump start on your gardening outside, but temperatures are still quite cool, you can use milk jugs to create mini-greenhouses. To make a min-greenhouse garden, collect clear plastic bottles from milk, juice, etc. Poke drainage holes in the bottom with scissors or something like a heated ice pick. Cut containers horizontally at least 4-inches from the bottom and discard the bottle caps. Gather your seeds and write the plant’s name and date planted on the container with a permanent marker. Also put a marked tag, such as a Popsicle stick inside each container. When planting begins in the spring it will reduce the confusion if your labels include a hint about where they go in the garden (sun or shade, wet or good drainage, etc.). Fill the bottom of each mini-greenhouse with loose soil such as commercial potting soil. Many people mix their own out of garden dirt, sand, compost and perlite. Wet the soil and let it drain. Tiny seeds that need light to germinate are pressed into the top of the soil and seeds that need dark to germinate are pressed into the soil. Secure the top of the greenhouses with tape. It does not have to be a perfect seal but you want it to hang together through rain, freeze, warm days and wind. Put the containers in a sunny spot where rain and snow can enter through the top. During periods of no rainfall, bottom water the greenhouses by putting them into a plastic and pouring water – not freezing cold water – into the pan. When the soil has absorbed enough water to be moist not wet, drain the saucers.